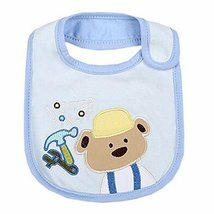 Lovely Tool Bear Cotton/PVC Adjustable Waterproof Baby Bib Pocket Bib 612"
Ships from Hong Kong.Side safety stickers design, won't hurt the baby's tender skin grinding; The middle of the double layer fabric with a soft layer of waterproof layer, both to achieve waterproof, and very comfortable; Environmental protection PVC film coated waterproof breathable; All use nontoxic dye on the back of the material, very healthy environmental protection. Size: 16*31 CM, 6.2*12.2". Suitable for babies who are under 1-year-old.